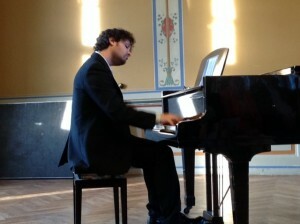 Born in Ortona, Italy, he obtained his Diploma with honors at the Pescara Conservatory afterwards studying chamber music at the well-known Accademia Pianistica “Incontri col Maestro” in Imola (I) with Piernarciso Masi and pianoforte with Leslie Howard (London, UK), Luciano Cerroni (Roma, I) and Sebastien Risler (Geneve,CH). He has performed as a soloist and in duo in various concerts arranged in Italy, Switzerland, United Kingdom, Denmark, Luxembourg, Belgium, Poland, France and Germany. He has collaborated with the National Tosti Institute, with the ‘Tosti Ensemble’,with spanish tenore Joaquin Pixan, with the <M&M> Orchestra and the Bacau Philarmonia Orchestra (Romania). He has been recipient of the prestigious “Logos Honorary Award” (2010). The movie “Swarmanoid, the movie”, for which he has written the soundtrack, has received the AAAI Best Video Award.